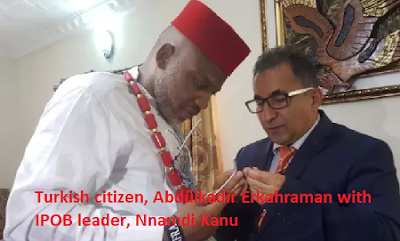 Turkey has denied supporting the secessionist agitations in Nigeria and disowned a Turkish citizen, Abdülkadir Erkahraman, who has expressed support for the Biafran agitation. He announced the visit on his Facebook page. The Turk encouraged “Biafrans” to “rise up and fight a good fight for freedom”. In response to the development, the Embassy of Turkey in Nigeria issued a release on its website. The embassy ‎distanced the Turkish government from Mr. Erkahraman’s visit to Mr. Kanu. In the statement on Saturday, the embassy said, “Erkahraman is not a Turkish diplomat or an official representative of the Turkish government. “Abdülkadir Erkahraman, a Turkish citizen, has been sharing videos for some time against the Nigerian Government and presents himself as a Turkish diplomat.